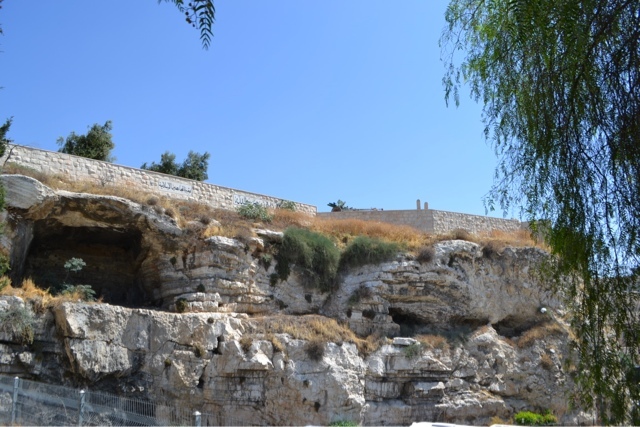 On Monday, August 5th, our last full day in Israel, we determined to do three things for sure: visit the Garden Tomb, the Jerusalem Church of the Nazarene, and the Western Wall. 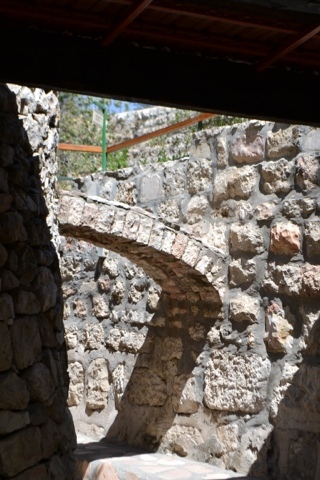 After a leisurely breakfast with some good conversation (it's been so great to have both my father and father-in-law together with me, to listen to them, to talk with them, and to listen to them talk to each other: a priceless experience), we walked to the Garden Tomb which is actually the closest well-known historical site to our hotel. 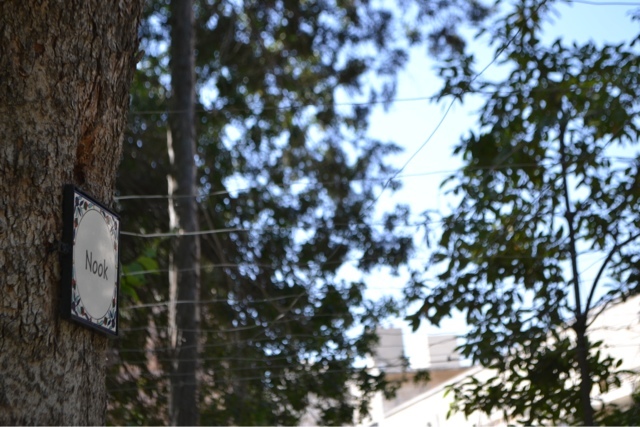 It was about a 5-minute walk from us. 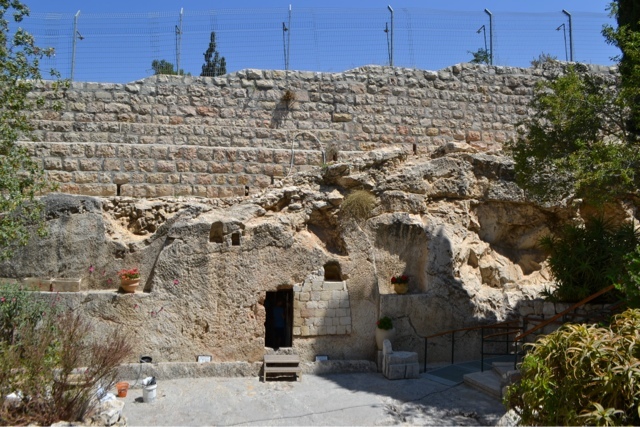 The Garden Tomb - first discovered in the 1840s, I believe - is overseen and owned by a British organization. There were about 8-10 Brits there to welcome us and answer questions. 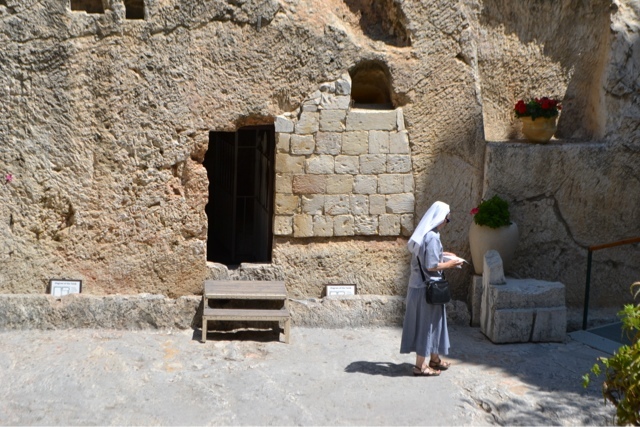 In short, the Garden Tomb was awesome. I really appreciated the way the location is presented. 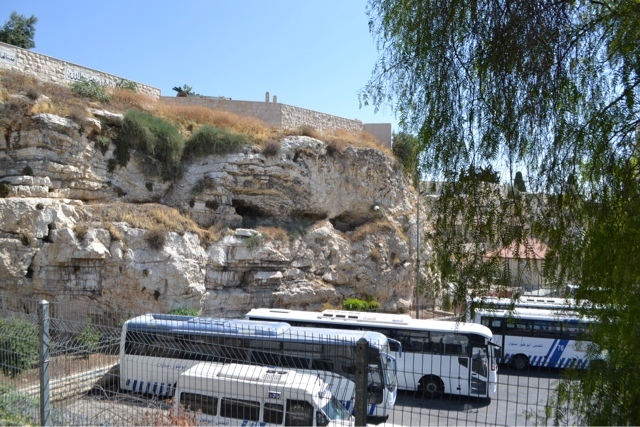 While most all of the sites and churches built over them that we've been to are rather "certain" of their historicity (that is: those overseeing them present it as certain), the Garden Tomb organization has gone a different direction to say, "You know...we really don't know, but it sure could be like this spot. The fact of the matter isn't nearly as important as the Truth that has come from the life, death, and resurrection of Jesus Christ." 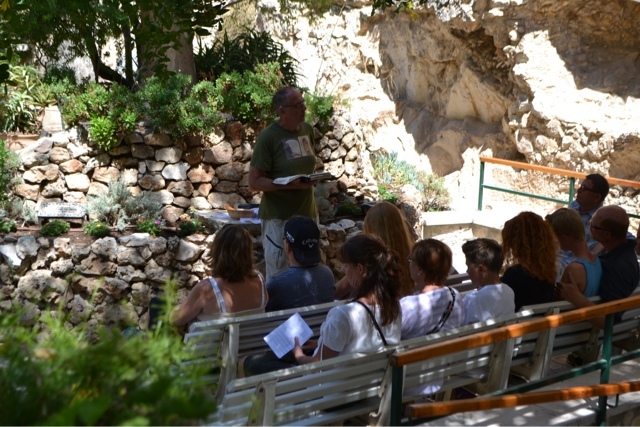 I don't know if it's the modern in me that says, "Yeah...right," to all the places that are sure of their historicity or the post-modern in me that says, "It just doesn't matter" (in relation to historicity), but I really appreciated the presentation (or lack there of) at the Garden Tomb. 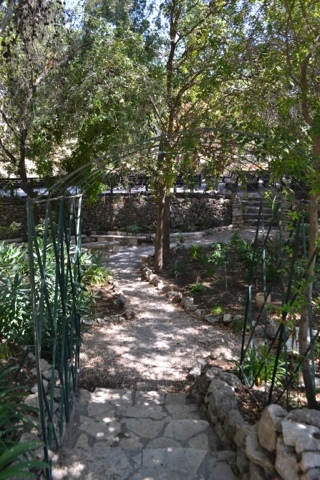 The garden is serviced by a nice long walking path with many spots to sit both for individuals and for groups. One such place had a name that I thought you North Street peeps would appreciate. The GT is a nice big garden (surrounded by a significant wall) in the middle of a mostly Arab neighborhood. 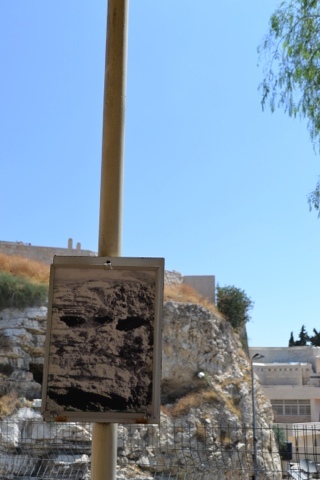 It sits beside a bus parking lot that is over-looked by a small cliff/hill that has a shape somewhat like the face of a skull. As you may remember, the Bible says that Jesus was crucified at a place called Golgatha, or loosely, "place of the skull." I sat at the place where you see this cliff for quite a while. It was memorable. Prayed and sang a hymn (to myself, of course). Conscious that it might "not" be the place, I didn't really care. It sure looked like something that could have been, and regardless: it's the closest thing to it, if not in a geographical sense, surely in how it might have looked (to me, at least). After a while, I continued on to the actual tomb. 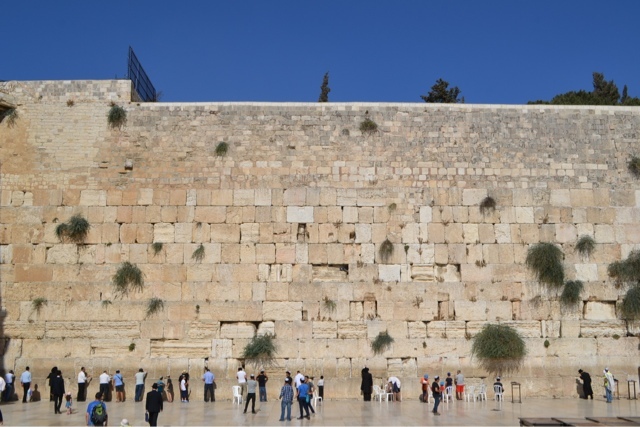 It is simply a rectangular hole in the wall with a place where the stone would be rolled away or into place. Inside is simple. But it's empty. There was a small church or group from Sweden at one of the locations where groups can sit (there were about 12 of these throughout the walkway of the garden - I'd love to have been able to share communion at one of them in particular with North Street. Who knows...). An older man from the congregation played Amazing Grace on the hand saw. It was beautiful. Most all sites we've visited either required an entry fee (more for the national parks, and slightly less for other sites). 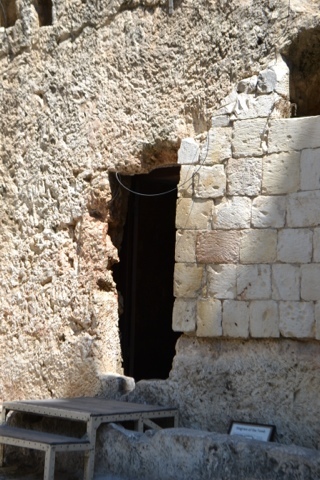 Very few sites didn't expect anything and the Garden Tomb was one of these. As such, I determined that I'd buy stuff from their gift shop, in which the prices weren't too bad anyway. I did buy from street vendors here and there as well. 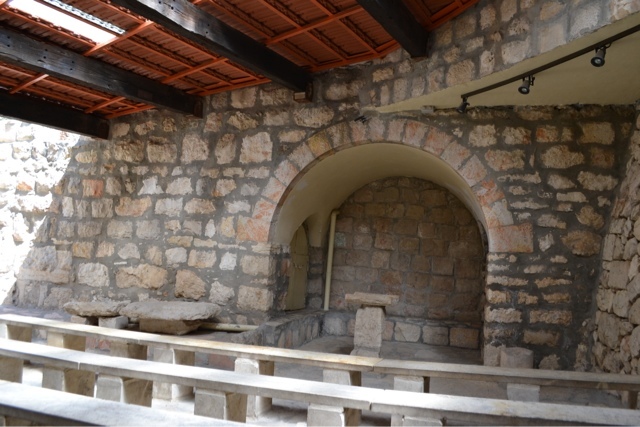 After the Garden Tomb, we literally only had to walk about 200 yards north to visit the building of the Jerusalem Church of the Nazarene. We had found out where it was from Lindell Browning the day before, whose office also sits in the building. 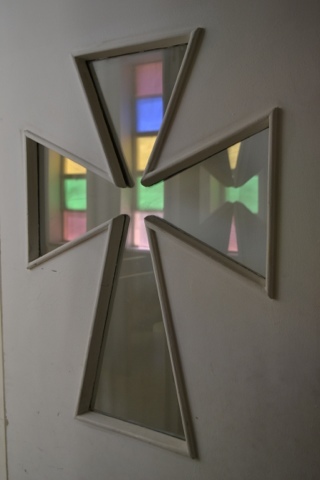 We were disappointed to find out that the Jerusalem Church's services are on Friday evenings, so we missed it (and we could have gone as we were just sitting in the hotel room that night, reading lots of great stuff but it would have been great to go). So we went in and talked with Lindell and Kay Browning for a while. I had gone to ENC with one of their daughters for two years (Erin) who married Brian Ketchum. They are ministering in France now. 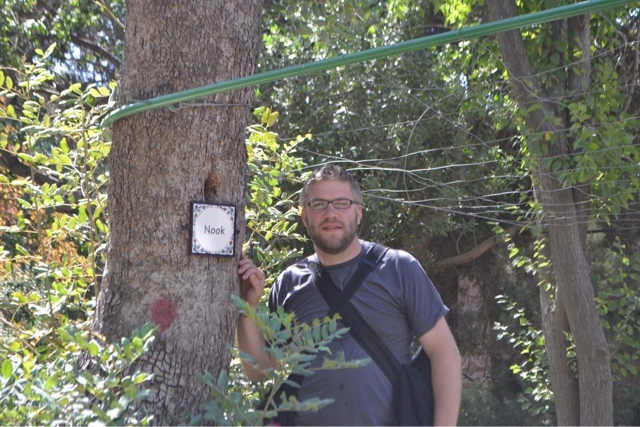 I love their story: Erin grew up in the Middle East and Brian grew up for a while in Haiti. As such, Erin speaks Arabic and Brian speaks French. Now they are raising their kids in France. I also met Tim Evans who is currently the pastor of the Jerusalem Church of the Nazarene. 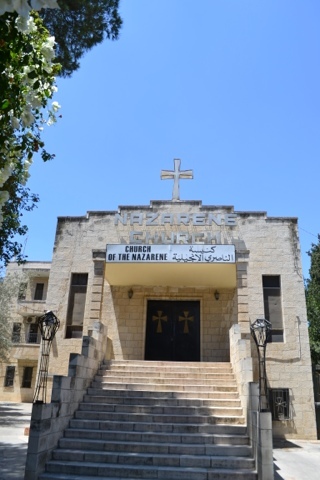 The church is an "international church," meaning that it is English-speaking and consists majoritively of American expats, young adults who are studying in Jerusalem or working for NGOs. Tim is soon to leave the church and will be serving a church in London. He grew up in Bangladesh and met his (British) wife while serving in Afghanistan. It was great seeing the building and even more so sitting and talking Naz stuff with these people. 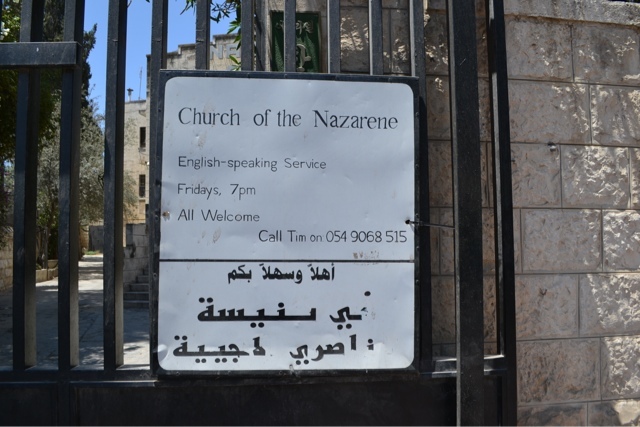 I didn't know them prior to being in Jerusalem, but getting to know them so quickly and easily is a beautiful kind of thing that happens in the Church of the Nazarene. Mutual friends abound. 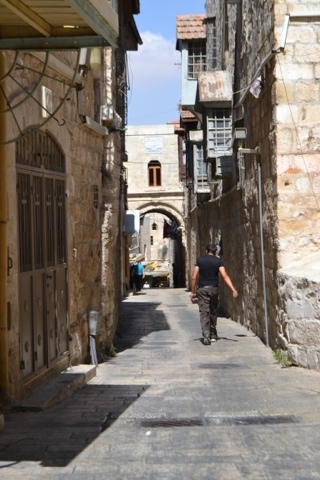 We then made our way back into the Old City. 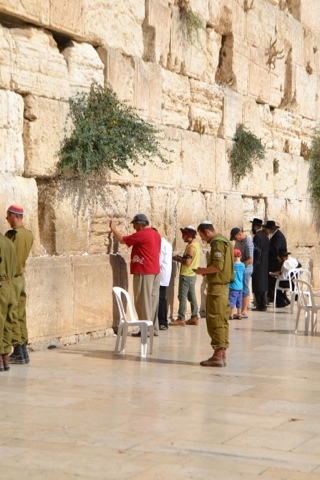 We decided to skip Herod's Gate to get in this time. 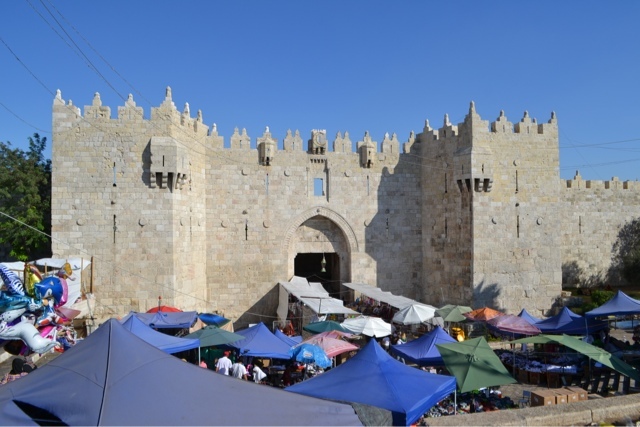 So we went to Damascus Gate, but it was so mobbed, we just stood there. We were cattle going nowhere. 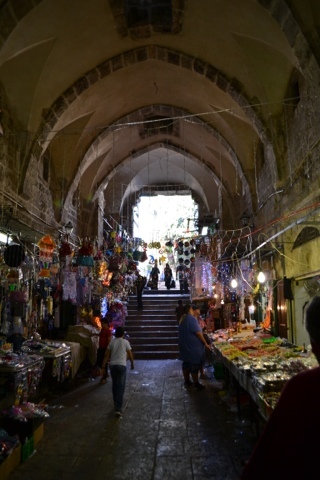 So I suggested that we walk up to the next gate, which leads into the Christian quarter. 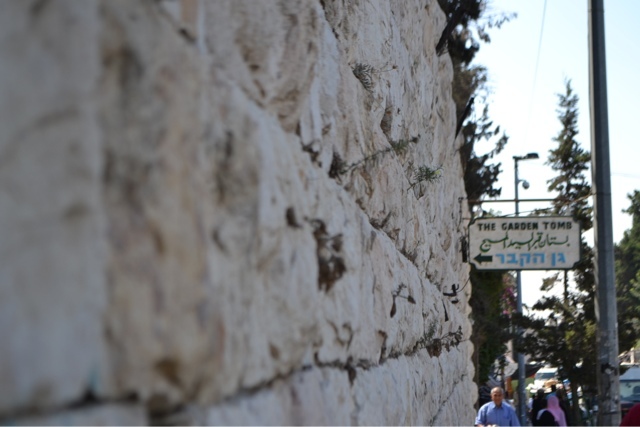 We walked through and sat next to the Church of the Redeemer for a quick and small lunch. We've been sharing a lot of things. We had more falafel and also ordered a hot dog. 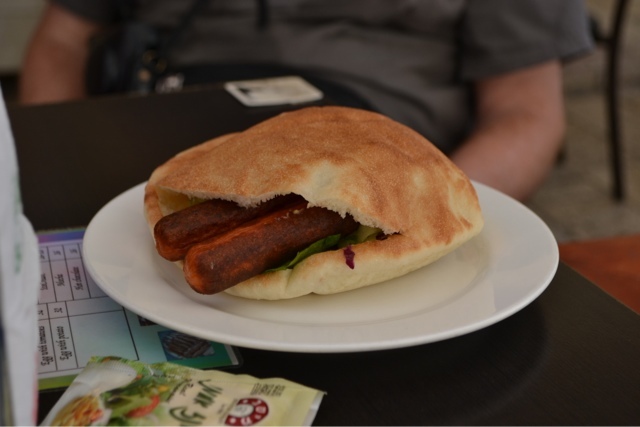 The hot dog came in a pita with lettuce, a first for me. 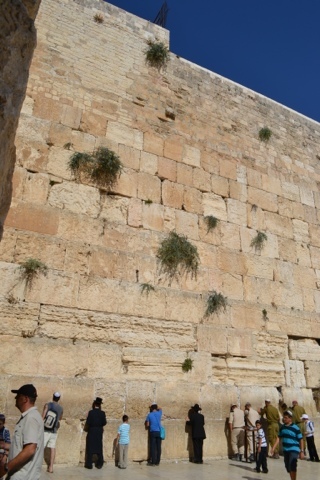 Then we finally made our way into the Jewish quarter and found the entrance to the Western Wall plaza. Seeing it was great. 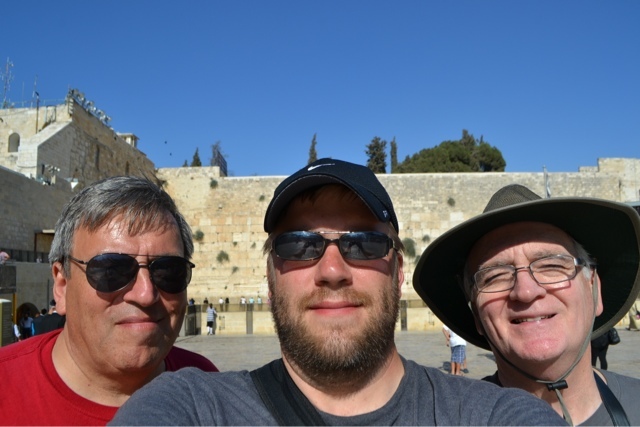 Dad prayed right at the wall while Ron and I kind of stayed back taking pictures, though I did pray a short prayer. There are separate sections for men and women. Heads must be covered for prayer. Most people wore yamikahs. Dad wore his Red Sox hat. 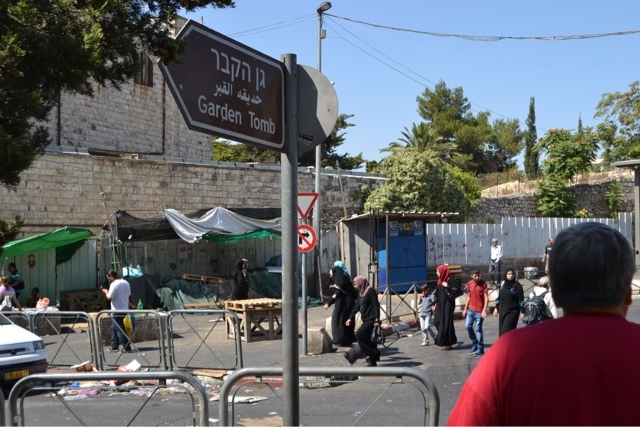 We then began our way back to our hotel, but were turned around twice by Israeli police or military because we weren't Muslim and were too close to the mosque. It wouldn't have been an issue if it weren't for it being Ramadan. 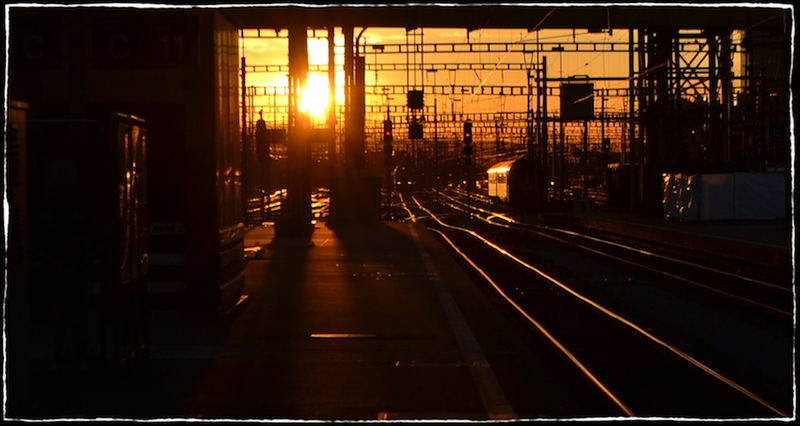 But it is certainly true that we were more free in moving around when we got here than in these later days. 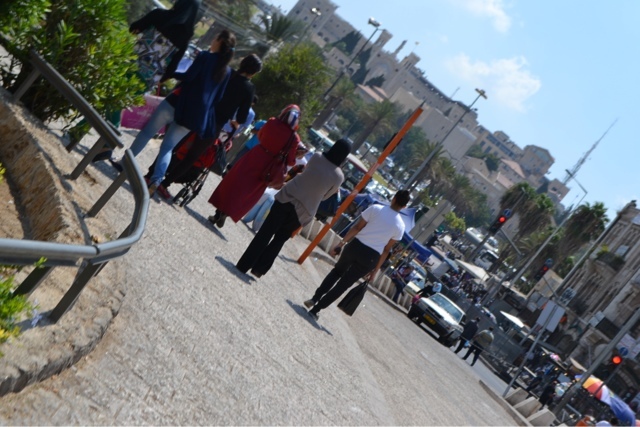 As Ramadan builds up to the end, more people come to Jerusalem. On Sunday night (the "Night of Power" or "Destiny"), we were told the next morning that the celebration & festivities went until 5:00 AM in the morning. We made it back to our hotel room and settled in to read more about what we'd seen that day, a practice that was pretty much ritual for us this whole week. It has been great to walk around mostly on our own. We certainly could have seen more on planned & guided tours (which have their benefits), but we liked being free to walk at our own pace and drive as we liked. We left this morning and are currently sitting on a Swiss Air flight from Tel Aviv to Zurich where I cannot wait to see my family.